During the summer of 1930 street vendor Wallace D. Fard appeared in Detroit, Michigan‘s Paradise Valley community, proclaiming himself to be the leader of the Nation of Islam (NOI) and proselytizing among his customers according to his Islamic beliefs. Fard’s doctrine revolved around the claim that Islam was the true religion for blacks and Christianity only the faith of the “white devils” who were inferior to blacks. His preaching of freedom, justice and equality for people of African descent rapidly gained him followers and within three years Fard developed a cohesive organization, renting a Detroit meeting hall as the NOI’S first Temple. One of his earliest disciples was Elijah Poole, who later changed his name to Elijah Muhammad. When Fard left the United States in 1934, Muhammad seized control over the organization, running it with absolute authority. By the early 1950s, the NOI had several thousand members and Temples in Detroit, Chicago (Illinois), Milwaukee (Wisconsin), Washington, D.C. and other major cities. During the spring of 1952, ex-convict Malcolm Little, later known as Malcolm X, joined the NOI. A charismatic orator, he soon became the Nation’s chief spokesman, created the organization’s newspaper Muhammad Speaks, and gaining wide-spread attention for the organization until he broke with the NOI in 1964 and was assassinated one year later. In 1959 the American public learned about the NOI for the first time when New York‘s WNTA-TV produced a documentary titled “The Hate that Hate Produced”, depicting the NOI as a black supremacist organization whose goal was the separation of blacks from the United States into a separate homeland in five Southern states. The reaction to the NOI’s ideas was overwhelmingly negative and civil rights leaders as well as other African Americans who were Muslims actively disassociated themselves from the organization’s ideology. The attacks on Elijah Muhammad and his organizations continued until his death in 1975 when his son Wallace D. Muhammad assumed the leadership of the NOI. He engineered a series of conceptual changes that brought the NOI in line with Orthodox Islamic practices and abandoned the theory of racial superiority. Dissidents within the organization who were dissatisfied with its new direction rallied around Minister Louis Farrakhan who in 1978 created the “new” Nation of Islam. The new Nation in fact returned to the original teachings of to the teachings of Elijah Muhammad. In 1995 Farrakhan and the new Nation of Islam convened the Million Man March on Washington D.C., an effort to publicly challenge the disintegration of both the black family and African Ameican communities. The March may have attracted nearly one million participants although the actual figure is disputed. 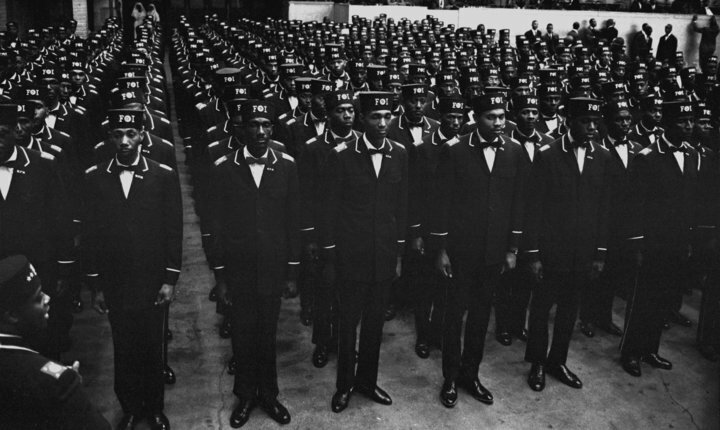 It clearly registered the Nation of Islam as an influential force among huge segments of the African American community even if the actual NOI membership remained less than 30,000. Today the Nation of Islam owns hundreds of businesses nationwide and operates its own farm to support its members. Edward E. Curtis IV, Islam in Black America: Identity, Liberation and Difference in African-American Islamic Thought (Albany: State University of New York Press, 2002); Martha F. Lee, The Nation of Islam: An American Millenarian Movement (Syracuse: Syracuse UP, 1996); Clifton E. Marsh, From Black Muslims to Muslims: The Resurrection, Transformation and Change of the Lost-Found Nation of Islam in America, 1930-1995 (Lanham, Maryland: Scarecrow, 1996).